Northeast Polk Literacy Council | …changing lives one person at a time. …changing lives one person at a time. The Northeast Polk Literacy Council, Inc. (NEPLC) supports adult literacy in northeast Polk County, Florida. Service areas include Auburndale, Winter Haven, Haines City and surrounding communities. 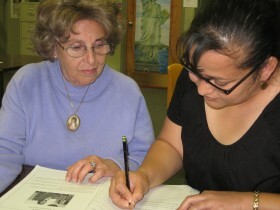 Our primary purpose to help adults 18 and over to learn to read. With the support of grants, and donations, the NEPLC is able to help individuals reach their hard-earned goal of becoming literate and vital members of society. We are proud to announce that NEPLC has received two grants – One from the GiveWell Community Foundation and one from the Dollar General Literacy Foundation! This funding will allow the NEPLC to serve more adults in Northeast Polk County and to provide more training for our tutors. We are proud partners! The NEPLC is a not for profit public charity under Internal Revenue Code Section 501(c)3. Won’t you please support us by donating a few dollars to our Bakeless Cake Sale?